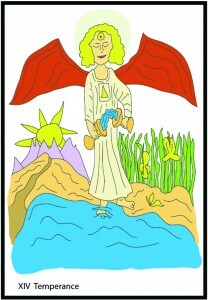 If your tarot number adds up to 14, your personality is represented by Temperance. Internal balance or the struggle towards it is integral to your personality. You strive for harmony between your emotional/spiritual and physical/mental self. Sometimes this is a difficult but discipline and self-control teaches you to blend these opposites to create a beautiful whole. You’re able to bring the lessons from the past to the present in new and innovative ways. The Temperance personality is especially attuned to the messages of the divine and at their best serve as bridges between the spirit and earthly plains. Life flows most smoothly when you pay attention to your soul’s voice and the Temperance personality can be especially adept at doing so. The Hierophant is the soul symbol for the Temperance personality.